Last year’s historic close flyby of Pluto by NASA’s New Horizons spacecraft put the outer Solar System firmly back in the spotlight, providing both scientists and the general public with ground-breaking and revolutionary discoveries about the far-off little world in the outer reaches of the Sun’s planetary family. And with more than two dozen other spacecraft scattered throughout the rest of the Solar System, planetary exploration has been keeping apace. Nevertheless, despite all this activity this long list of active space missions has two glaring omissions: Uranus and Neptune. Despite this lack in our coverage of the Solar System, the importance of a dedicated mission to the ice giants hasn’t been lost on the planetary science community. “To have a complete understanding of our solar system we must study all of its components,” says Chris Arridge, a research fellow at University College London’s Mullard Space Science Laboratory. “It’s like having a huge jigsaw and only having half the pieces – we need to get all those pieces to have a chance of being able to see the big picture.” With this thinking in mind, a Uranus orbiter was listed as the third highest priority Flagship mission after Mars and Europa, in the 2013-2022 U.S. Planetary Science Decadal Survey. Hofstadter has taken part in various studies through the years that have investigated concepts for missions to Uranus which haven’t been selected by the U.S. space agency to date, due to severe budget cuts to its planetary science programs. The European Space Agency similarly weighted in on the subject during 2010-11, while evaluating a Uranus orbital mission concept called “Uranus Pathfinder” that had received a very positive assessment from the European science community, though wasn’t eventually selected for implementation by ESA either. Plans that had been drawn for alternate Uranus orbiter concepts under NASA’s New Horizons and Discovery-class mission profiles were met with the same fate as well. However, all does not appear to have been lost. In 2015, NASA announced it would begin work on early feasibility studies for an orbiter mission to either one of the ice giants. The results of these studies, which are expected to be made public by the end of the year, can be seen as preparatory work, soliciting ideas from the scientific community for the next Planetary Science Decadal Survey that is due to come out in a few years. Even though they remain somewhat neglected in the annals of robotic space exploration, the very mysterious ice giants at the far reaches of the Solar System beckon. AmericaSpace recently spoke with Dr. Mark Hofstadter as well as Dr. Alan Stern, principal investigator for NASA’s New Horizons mission—both experts in the field of outer Solar System exploration—about the prospect of missions to Uranus and Neptune and what it would take to get us there. Dr. Stern, on a previous conversation we had in the past, you had refered to the Kuiper Belt as the third large expanse of the Solar System. 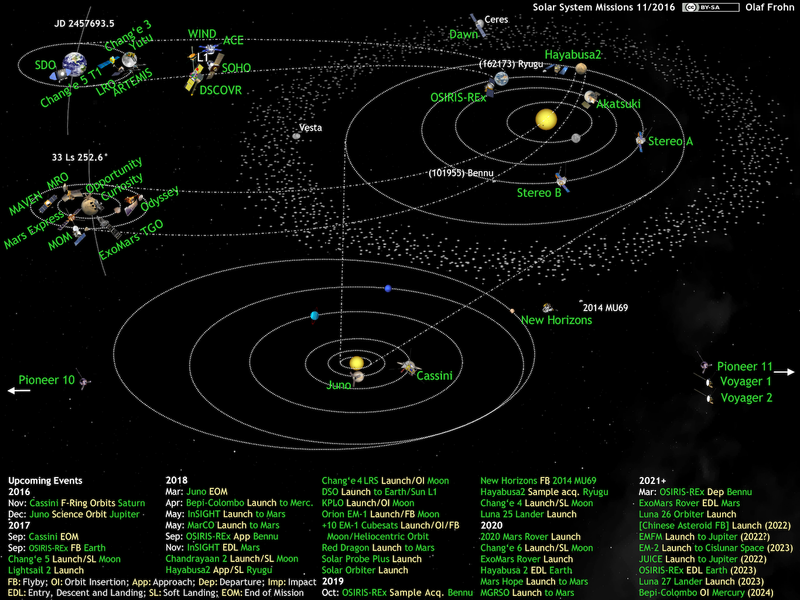 In light of the data from the New Horizons mission, what have we learned about this region of our Solar System? Dr. Stern: Well, we know a lot. The first modern Kuiper Belt Object discoveries, besides Pluto, were made in 1992 and now we now have a census of almost 2,000 known KBOs. We know a lot about their chemical structure, their sizes, and colors. Many have satellites of their own. Most—unlike Pluto—have no atmospheres. And we know a lot about their origins. How does Neptune’s moon Triton compared to Pluto and Charon? Are they generally similar or different objects? Dr. Stern: Well, as you know Triton used to be a small planet of its own, orbiting the Sun and was captured into orbit around Neptune long ago. It’s about Pluto’s size and it has other similarities to Pluto as well. It’s surface composition is broadly similar to Pluto’s as is its atmospheric composition. What we know of Triton’s geology is that it’s different than Pluto’s—more simple. And, of course, Triton is itself a satellite of Neptune and doesn’t have any satellites of its own like Pluto, which has five. So, if you take Pluto, Charon, and Triton, these are three of the 10 largest bodies in the Kuiper Belt and they are each very different from one another, just as the terrestrial planets—Venus, Earth and Mars, and Mercury—are very different. I think we’re finding that the small planets of the Kuiper Belt are a very heterogeneous population and that future missions that might be sent to Eris or Makemake or Sedna are very likely to find still more variation. This brings me to my next question: Why the case for missions to Uranus and Neptune? What are the big unknowns about these planets and how do they fit in the bigger picture about the formation and evolution of our Solar System? Dr. Stern: Let me start by saying that the normal progression in planetary exploration begins with flybys and proceeds with orbiters and more complex missions. With the giant planets, Jupiter and Saturn the first flybys were made with Pioneer and Voyager in the 1970s and ’80s, and both planets had been followed up with very productive orbiter missions like Galileo and Cassini. The two smaller giant planets, Uranus and Neptune, which have fascinating ring systems, fascinating meteorology, fascinating magnetospheres, fascinating satellite systems, have not yet been followed up with orbiters. There has been the desire for a long time to do that, but these missions haven’t gotten to the top of the list. At the same time, many exoplanets that have been discovered around nearby and distant stars have similar mass and size to the ice giants, Uranus and Neptune. So, from a combined planetary and astrophysical, exoplanetary science perspective, there is a general consensus that a return mission with an orbiter to either Uranus or Neptune, would be extremely valuable in advancing our knowledge of both scientific fields. And I think that we’ll gonna live to see it! Dr. Hofstadter: It is first important to understand that Uranus and Neptune are fundamentally different from all the other planets in our Solar System. Gas giants, like Jupiter and Saturn, are almost entirely made up of hydrogen and helium. Terrestrial planets, like the Earth, are almost entirely made up of what are commonly referred to as “rocks”—relatively heavy elements that are found in solid form in forming solar systems, things like silicates and irons. We believe the ice giants are, by mass, 2/3 water (mixed with methane, ammonia, and other species). Water and those other species are typically found as solid ice in the earliest stages of forming planetary systems, and are therefore referred to as “ices.” Hence the name “Ice Giants” for Uranus and Neptune. Today, however, very little solid water exists on these planets. Most of the water is in liquid form, meaning these planets are primarily ocean! We know from their average density that Uranus and Neptune have a lot of water, but exactly how they are put together is a big mystery. From the gravity data we received from the Voyager flybys in 1986 (Uranus) and 1989 (Neptune), and from watching how the Uranian rings move, it appears that the planets are not simple, three-layer objects, with the densest rock in the center, surrounded by ocean with a hydrogen/helium atmosphere above it all. Instead there appear to be mixed phases, with intermediate densities. We’d love to have more information on how things are arranged inside these planets, as that will give us clues as to how these planets formed and evolved. The interior structure may also shed light on the mystery of Uranus’ internal heat. All the giant planets are expected to give off significant amounts of heat from their interiors, radiating away energy left over from their formation. And, in fact, we observe this on all the planets except Uranus. So where did Uranus’ internal heat go? Was it radiated out to space rapidly, perhaps due to the giant impact which tipped it over on its side, or is that heat somehow trapped inside the planet today? Another big question we’d like to answer is where the ice giants formed. We’ve recently realized that planets can migrate during solar system formation, moving closer to or farther away from their central star. Some models have all the giant planets (gas- and ice-giants) moving around quite a bit, and profoundly altering the location of everything else (comets, asteroids, terrestrial planets) in the Solar System. By measuring the abundance of noble gases and certain isotopic ratios in the planets today, we think we can learn more about the temperature at which the planets formed, and hence, their distance from the Sun at that time. There are also important questions associated with other aspects of the Uranus and Neptune systems. Each planet has rings, satellites, and a magnetosphere that are different from what is seen elsewhere in the Solar System. The large satellites of Uranus show unique geologic features we’d like to understand (such as the tortured-looking surface of Miranda, a small moon with the tallest cliff in the Solar System), while Neptune’s satellite Triton is thought to be a captured Kuiper Belt object, similar to Pluto, potentially harboring an ocean under its icy surface. Uranus’ main rings are narrow and dense, while Neptune’s are clumpy, both having features we don’t see in Saturn’s broad rings, and having features that change on decadal time-scales. A final important question about these planets is how their unusual magnetic fields are generated, and how their magnetospheres interact with the solar wind. Due to the complexity of their magnetic fields, and the large tilt of their magnetic axes with respect to their rotation axes, we expect the solar wind interactions with the planetary fields to challenge our understanding of magnetic and plasma interactions. And finally, I’ll mention another reason why understanding Uranus and Neptune is important. It turns out that ice giants are much more common in our galaxy than they are in our Solar System. Of the thousands of planets discovered around other stars, most appear to be ice giants. We want to study our local ice giants, Uranus and Neptune, to better understand all those exoplanets. Several proposals have been submitted through the years to NASA’s Outer Planets Assessment Group for a dedicated orbital mission to Uranus. What has been the space agency’s reception as well as that of the planetary science community on such a prospect? Dr. Stern: Well, there are other more knowledgeable people who can answer that question, cause I’ve been off in another corner of the Solar System (laughs). There have been a number of studies about Uranus/Neptune orbiters and follow-up flybys which could be very productive, some even carrying atmosphere probes and the general consensus is that these are entirely feasible from a technical standpoint. And there have been different studies, different implementations depending upon what launch vehicle you choose, how much mass you have, how much time you want to take, and how much money you want to spend. But there are no technical show-stoppers now that the U.S. is back in the business of producing plutonium, which is necessary for getting orbiters to Uranus or Neptune. The only impediment to doing this is just the funding. To do a mission like this, the general view has been that the right middle ground is a spacecraft considerably smaller than Cassini but still more capable than a typical Mars orbiter. As for the price, it should probably be in the range of the proposed Europa Orbiter mission budget. Dr. Hofstadter: First, a clarification. OPAG is a forum for the scientific community to express its desires and opinions to NASA, and for NASA to ask that community for inputs. While many missions are discussed in the context of OPAG, we would not refer to them as “Proposals.” That word is typically reserved for a very formal submission to NASA. None-the-less, as you said, I and others have talked about ice giant mission for several years at OPAG and other venues. Both NASA and the outer planet community have been very supportive of those ideas. In particular, back in 2011 when the last Planetary Science Decadal Survey was finished, a Uranus orbiter mission was made a high priority, and was recommended as the third Flagship mission for NASA to fly this decade (after a Mars and Europa mission). A budget crisis soon after the Decadal report was published slowed the pace of missions down, but now that the Mars 2020 and Europa multi-flyby missions are on track, the community and NASA’s thoughts are turning toward Uranus and Neptune. In fact, late last year NASA commissioned an extensive study of ice giant missions to help guide future plans. The final report from that study should be completed before the end of 2016. The European Space Agency has also been considering similar proposals to the ice giants, with a conceptual launch date in the late 2020s, possibly as a joint venture with NASA. To your knowledge, Dr. Hofstadter, what is the current status of these specific studies? Dr. Hofstadter: The scientific community, NASA, and ESA, all recognize the benefits of some-sort of joint mission. It reduces the cost to each agency, allows technologies to be shared, and maximizes the number of scientists able to participate. For this reason, exploring options for international cooperation was one of the goals of the mission study I mentioned earlier, which NASA is completing right now. In fact, ESA participated in this study, with two of the 14 members of the Science Definition Team being from Europe, and ESA receiving the same progress reports as NASA. It is my impression—and I must emphasize that this is a personal opinion, not policy—that both NASA and ESA recognize the importance of an ice giant mission, and both are working to find the best way to make it happen. How soon can we realistically expect to see a spacecraft go to either Uranus or Neptune? Dr. Stern: Well, it depends on what the consensus really is within the planetary science community. For example, if it were to do a flyby mission, one perhaps including an atmospheric probe and then also doing additional exploration in the Kuiper Belt, it might be pretty quick. This might be a mission that could launch in the mid-2020s. For an orbiter mission it will take longer because it will be more expensive and that might not launch until the late 2020s. Depending on the implementation you choose, there is a wide range of possibilities, though going to Uranus is quicker than going out to Neptune. Big heavy missions are slower, but using NASA’s Space Launch System rocket will make it faster and the arrival times will be sometime in the 2030s or after for an orbiter. Dr. Hofstadter: While there is no definitive path forward as yet, I hope that within the next five years (tied in part to the next Planetary Science Decadal Survey) we will converge on a specific plan. Such a mission would likely get to its target around 2040. There are options to get there sooner, but 2040 is a realistic target. Has the planetary science community taken that launch capability into consideration when designing mission concepts to the outer Solar System in general and how could the SLS help advance such concepts for becoming a reality sooner rather than later? Dr. Stern: Certainly for the ice giants, for Uranus and Neptune, the answer is, yes. Currently, NASA hasn’t funded any studies for follow-up missions to Pluto, but I believe that hasn’t been because the space agency has received recommendations from us on that. We’ve been trying to digest what we’ve learned [from New Horizons] and decide what the next Pluto mission to go and study should be. Dr. Hofstadter: Assessing the advantages of SLS is also part of the current ice giant mission study. As you said, SLS gives us options to send more mass, or to get to the outer Solar System quicker, or some combination of the two. Using a mission to Uranus as an example, typical flight times with an Atlas or Delta-IV Heavy-type booster are on the order of 10 years for a spacecraft you want to put into orbit. SLS could get the same spacecraft there in six or seven years. An extreme case is to combine SLS with aero-capture. The latter uses the target planet’s atmosphere to slow down and get captured into orbit, eliminating the need to burn large amounts of fuel. With that combination, you can use faster trajectories and still get into orbit, and one could get to Uranus within five years. Another interesting idea that SLS allows us to consider is a two-spacecraft, two-planet mission. Uranus and Neptune are not properly aligned for a single spacecraft to visit both, but with SLS you can launch two spacecraft and give them different trajectories after they leave Earth, thereby visiting both ice giants with a single launch. Seeing both Uranus and Neptune would tremendously advance our understanding of ice giants, so this is scientifically an attractive option. Of course, from a scientific point of view, it doesn’t matter if the two spacecraft are launched together on a single vehicle or launched a few years apart on separate boosters, so one can let cost and programmatic considerations decide whether or not to use SLS. One of the major hurdles in sending a spacecraft to explore beyond the orbit of Jupiter is the U.S.’s availability of supplies on Plutonium-238, which is used for powering missions to the outer Solar System. How does that affect the planning for missions to Uranus and Neptune? So it all comes down to budget? Dr. Stern: Exactly. Unfortunately, we’ve been on a “100-percent-of-nothing” mode with both Uranus and Neptune and also with Mars Sample Return forever, because every time we start to get serious we load it up too much and we get nothing. Let’s turn to a more uplifting topic. What’s in store for the New Horizons spacecraft between now and 2019, when it will rendezvous with KBO 2014 MU69? Dr. Stern: The spacecraft is conducting around-the-clock surveys of the Kuiper Belt environment, using the plasma sensors and the dust instrument and occasionally using the ultraviolet spectrometer to study the neutral gas in the heliosphere. And then, every few months we make telescopic observations of other KBOs. Up till now we’ve observed a total of seven, and in January we’ll be observing half a dozen more as well. We make the kind of measurements you can’t make from the Earth. Will the New Horizons data compliment the ones made from Voyagers 1 and 2 regarding the flow of the solar wind at the end of the heliosphere? Dr. Stern: Yes, that’s correct. Remember, also the Pioneer spacecraft travelled to this region, so there are actually four distinct data sets [about the heliopause] and a fifth one by New Horizons spacecraft, but the latter carries much more sensitive space plasma instruments and the first dust detector to operate this far out, ever. So, our data sets are really unique. It’s not just an additional measurement in time, it’s a bold new capability. Dr. Hofstadter, major advancements in ground-based telescopes and image processing techniques that have taken place in the last couple of decades have allowed astronomers to better study Uranus and Neptune. What have we learned about these worlds since the brief Voyager flybys in the 1980s? Dr. Hofstadter: We’ve learned quite a bit since Voyager. Ground-based observations have told us about dynamic features in the ice giant systems which a single flyby could never resolve. Things such as weather-related and seasonal variations in atmospheric activity, and chaotic interactions between rings and small moons on decadal time-scales. Earth and near-Earth observations (e.g. from the Spitzer Space Telescope) have also told us a lot about the composition of the satellites and the upper atmospheres of Uranus and Neptune. While Earth-based capabilities will continue to improve, however, there are key things which can only be done in-situ. Putting a probe into the atmosphere to measure noble gases and key isotopic ratios is an example, another being measurements of magnetic fields, charged particles, and plasmas to understand ice giant magnetospheres. So while my roots are as a ground-based astronomer, I look forward to the tremendous leap in our understanding that a dedicated ice-giant mission will provide. This would be awesome! One of the most intriguing mysteries in our Solar System are those ice giants. It would be amazing to discover for sure what happened to Uranus, why it’s tipped on its side and how affects its weather and who knows, maybe discover more moons, thought i think that could be the case for Neptune. Maybe its inffluence in the Kuiper Belt could be stated firmly, way more than we think. This is so exciting! Keep up the great work! Tremendously informative article, Leonidas. I like the two-planet, two-spacecraft concept. I also agree that 80% of something is better than 100% of nothing Let’s not have funding be a limiting factor in planning these missions. Absolutely couldn’t agree more Debbie and Tom. Leonidas, your superlative research and writing has resulted in yet another of your truly EXCELLENT articles. At this Christmas season, thank you very much for the gift of knowledge, a gift that will last, and be used, for many years to come.